서울에는 다양한 문화자원 밀집지역이 있다. 인사동에는 공예와 화랑이 밀집되어 있으며, 인접한 북촌·삼청동엔 화랑과 미술관이 밀집되어 있다. 대학로엔 공연장이 밀집되어 있으며, 삼각지엔 미술화방들이 밀집되어 있다. 밀집된 곳에 더욱 몰리는 밀집경제의 속성을 지니고 있는 예술상품은 다른 어떤 상품보다 자원 밀집이 강하게 이루어져 특정 이미지를 창출하는 지역에 밀집하는 속성을 지니고 있다. 이런 속성으로 이루어진 지역이 서울에 13곳이 있다. 다른 한편, 특정 자원이 밀집되어 아우라를 형성하고 있는 지역 또한 많다. 가구, 음식, 패션, 생활 등 그 요소도 다양하다. 서울이 오랜 역사성을 지니고 있는 만큼, 이런 지역적 특화나 아우라의 형성은 더욱더 가중 될 것이다. 도시에서 중요한 것은 매력적인 거리환경을 갖추고 있는 지역이 얼마나 있느냐 하는 것이다. 그런 점에서 이런‘장소’를 보전하는 한편, 문화공간으로서 활성화하는 방안이 고려되어야 할 것이다. There are many cultural clusters in Seoul, as shown in Insadong, Bukchon and Samcheong-dong with many galleries and art museums. 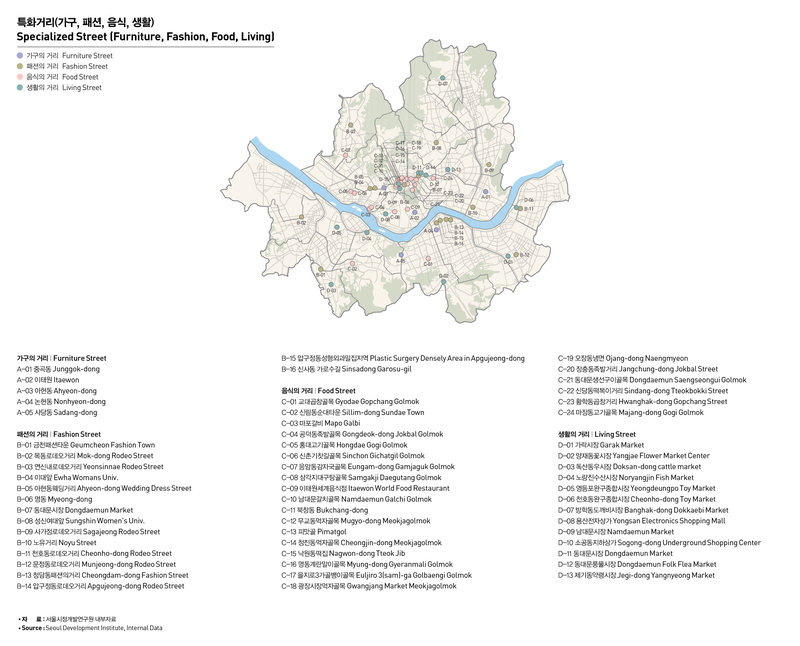 Plenty of performance facilities are concentrated in Daehang-ro, and fine art studios in Samgakji. As the density of cultural resources is higher than any other resource, cultural products tend to be concentrated in a region with a specific image. 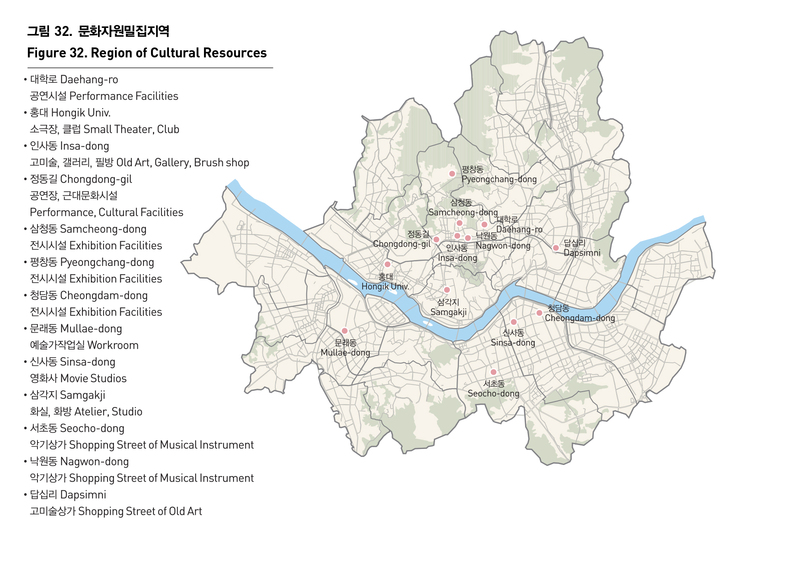 As a result, 13 cultural clusters have taken shape in Seoul. Many regions show a characteristic atmosphere, thanks to concentration of specific resources, including food, fashion and life style. 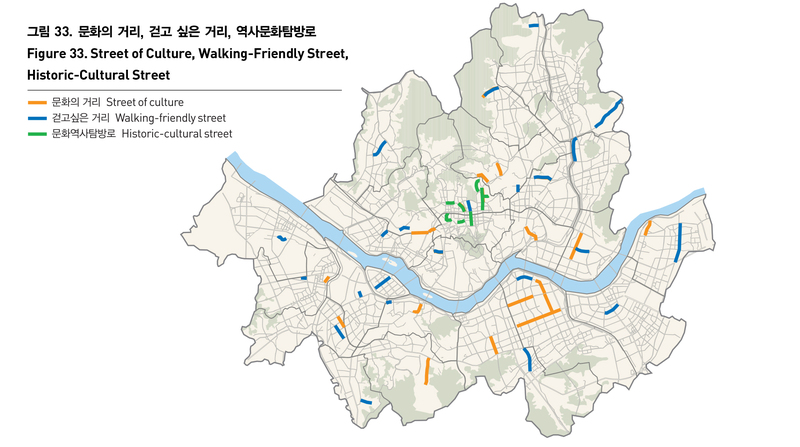 Seoul needs to preserve this cluster and reinforce its function of cultural place, in an effort to make Seoul equipped with more and more attractive streets.